'Santa Filomena' (1857), The Poetical Works of Henry Wadsworth Longfellow? (1867), 333. 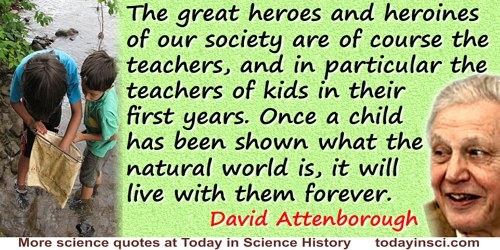 The great heroes and heroines of our society are of course the teachers, and in particular the teachers of kids in their first years. Once a child has been shown what the natural world is, it will live with them forever. As quoted in Alexandra Pope, 'Attenborough Awarded RCGS Gold', Canadian Geographic, (May 2017), 137, No. 3, 73.